In March 2013 my painting company was asked to install a technically challenging high gloss finish on a rail cap/spindle build as part of a one of a kind custom staircase inspired by a historic staircase at the Compagnon Artisan School in France. The staircase was design and installed by our colleagues at Seattle Stair & Design. The owner and design team wanted the highest gloss finish in black for the handrails with a custom tinted off-white in high gloss to compliment the black cap and adjacent natural wood tones. Shearer Painting was asked to create full paint finish mockups for Owner and Design Team evaluation for this unique interior painting. The level of gloss was one of several considerations (durabilty, reflective luminescence, etc). Full scale color substrate mock up installs are time consuming and costly; on this project the sheer scale and cost of the project warranted that no option be left unexplored. The staircase is the center piece to a Seattle water front residence with 180 degree water reflectance into the home (lots of natural light!!). Sherwin Williams oil enamels in Black and white vs. Fine Paints of Europe Hollandlac Brilliant in Black and White. Videos and pictures are inadequate to reproduce the gloss difference. The entire design team and the owner all agreed the Fine Paints was a significantly higher gloss. This has repeatedly been my professional experience with architectural finishes (also the opinion of many painting contractors). There are specialty/exotic coatings particularly designed for automotive finishes (we have used them) but the performance on non metal substrates is less than desirable as surfaces expand and contract at different rates; and impossible to cost effectively touchup when maintenance is needed. There are painting contractors and cabinet finishers that advocate automotive finishes; in my opinion they look great at install but are regrettable if the surfaces are in high traffic areas (like stairwells and kitchens). Shearer Painting had a long run of achieving high gloss finishes in the late 1990’s with oil base enamels followed up with micro abrasives (such as rotten stone). Almost all the high quality alkyd enamel paints available before 1997 are greatly diminished in terms of hardness and color retention (although the product names remain the same). We have almost completely abandoned this technique except for a handful of owners and designers who insist on it. Waterbased enamels are greatly improved since the ban of oil based paints in states such as California. 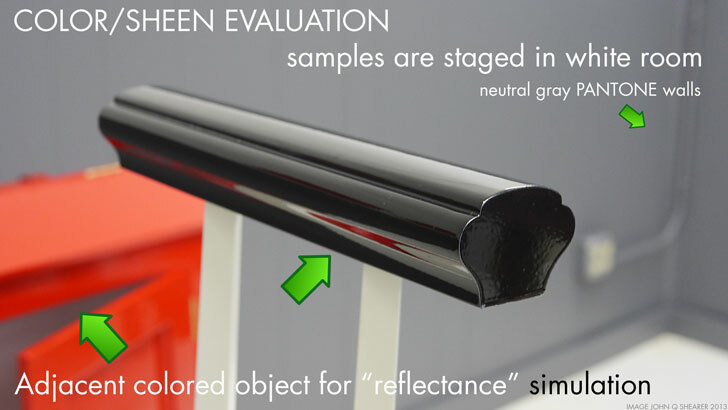 Read my 2011 water based enamel evaluation.